Rui Zink was born in Lisbon in 1961, where he is now a writer and university lecturer. He was a regular guest on late-night TV discussion programmes and he has become popular as an agent provocateur in Lisbon’s cultural scene. 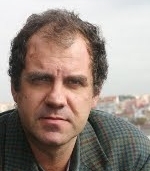 Zink is the author of more than twenty books, including A arte suprema, the first Portuguese graphic novel, and Dádiva Divina, which was awarded Portugal’s prestigious Pen Club Award.